The online supermarket certainly had happier holidays than most of its competitors. The supermarket game isn’t easy at the moment. Trading updates from Sainsbury’s, Tesco and Morrisons in the last 10 days have all held pretty bad news, even if some were better than expected. Not so for Ocado. The posh online supermarket said today that in December sales were up 14.8% - not as rapid as the likes of Lidl and Aldi but way above the growth rate of its supplier Waitrose and the other major players. Sales hit £6m on its biggest day in the run up to Christmas, up 15% on last year. There are signs Ocado managed to sidestep the logistical headaches that put a dampener on Christmas for the likes of M&S. In the seven days up to Christmas, its customer fulfilment centres handled 40% more items than the same time last year. The news caps off a strong year for the grocer, which is expected to deliver its first ever full-year profits when its results come out on February 3rd. 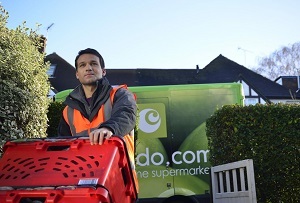 In January it helped Morrisons launch its online shopping; a move which came too late to save the larger supermarket’s boss Dalton Philips, who was ousted yesterday, but is thought to have been a boon to Ocado. Philips' departure probably won't herald the end of the deal but is unlikely to be seen as good news for Ocado. It seems the positive results weren’t enough to allay the concerns of investors and analysts though, as its shares dipped 1.76% to 402.7p in early trading. That’s perhaps because some are concerned that Ocado isn’t immune to the discount frenzy affecting groceries at the moment. ‘With the Big Four now aggressively reducing prices and margins, Ocado will have to do the same: but has it got the scale and financial strength?’ said John Ibbotson of consultants Retal Vision. Perhaps they are also concerned that Waitrose will cease its relationship with the business, through which it supplies a substantial amount of goods. Waitrose has built up its own online offering and reportedly has the chance to back out of the deal in September. Turbulent times ahead.